Great show!!! Keep it going!! It’s competing with March Madness! We record and watch it later. Geeez, give it a chance. Good acting, fun story lines, still want to know why HG Wells refers to John as “my friend” when he knows he is Jack the Ripper… PULEEEZE do not cancel! From what i remember of the first episode HG invited friends round to his house (John being one of them so it was before HG knew he was Jack the Ripper). The police knocked on the door because there had been a murder and John used the time machine to escape capture. While it is a bit interesting, I’m finding there are too many mysterious people showing up who know EVERYTHING. Yet when Jack goes back to save his son they say he can’t change history as it will cause problems. Clearly history has been massively altered if so many people know of the time machine. It’s just a bit messy and too all over the place to work long term. But I’m curious, why does he even allow the time machine to work at all without the key? SO spot on with your comments! Hope they listen! No! Don’t cancel Time after Time please! Love the show! But it’s on the wrong night! No way! Are you crazy? This show is classic. No don’t cancel it! I really like the show and have now gotten my daughter to watch it. She is picking up the early episodes on Demand. Every time a show I think is worth watching, the networks pull it before it has a chance. Unfortunately I am in full support of cancelling this show. My wife and I love sci-fi shows and enjoy Timeless. But watching the pilot episode of this show had too many inconsistencies and was just plain stupid. How many times can the H.G. Wells character have his new girlfriend held hostage for they “key” .. it lost us after the first episode because people from 1880’s wouldn’t know about getting an apartment, new hip clothing, a disposable burner “smart phone” in just a couple days. Especially in New York. Too ridiculous for us to follow. I’ll chime in with the sentiment that “Timeless” is excellent and needs to be kept. The others are rather feeble “elevator pitches” that are just trying to jump on the bandwagon, or time machine. As to “Time After Time”, I loved the original movie, but that is all this story-concept should be; a movie. How anyone can think it could be expanded to an ongoing series needs to go back to Program & Development School. I love this show. BUT I record and watch on weekends. My weeks are too full to watch tv. Most people do that now, so the ratings and viewers will automatically be down. They have cancelled so many of my shows the past couple of years because of that. It makes me SO mad!!! I was excited to begin this series, as I love Timeless and hoped this might fill that hole. I was disappointed almost immediately. The acting is wooden and colorless, the plot is ridiculous, and the dialogue is cliche, stilted, and unbelievable to the point of stupidity. 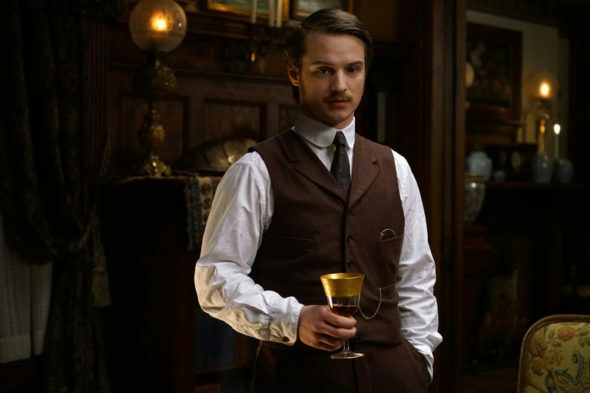 Freddie Stroma is awful, and Genesis Rodriguez is as interesting as oatmeal. As of last night’s episode, I’ve given it up. Oh well, one less show clogging up my DVR on Sunday night. I actually really enjoy watching the show and I find it very interesting. I’d actually be disappointed if they cancelled this show.